My mom’s here for the week hanging out with me (and doing dishes) while Lucas is in China. 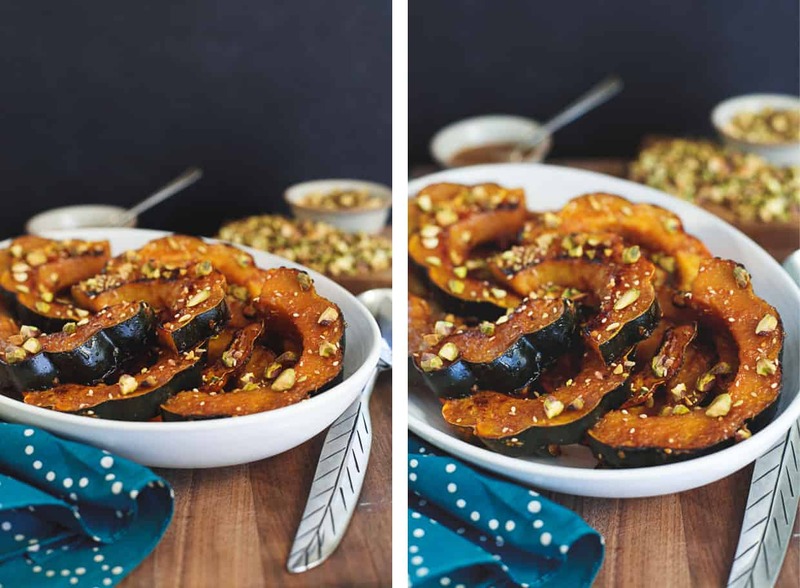 I’ve been spending my days jumping between meetings and stretches of dissertation writing, so when I popped over here to tell you about this Ginger Miso Acorn Squash dish, I was stumped. I turned to my mom for inspiration, “tell me a story mom.” And that’s when I realized, that was my story. Disclosure: The SoyFoods Council and the Healthy Aperture Network sponsored this post as part of their ‘#SoyInspired Thanksgiving’ campaign. Please rest-assured that all opinions expressed here are 100% my own. Whenever I had trouble falling asleep as a kid (which was basically every night because I’ve always been a night owl), my mom would come lay next to me. And every single night, I’d request, “tell me a story about when you were a little girl.” Not, “read this book to me.” No, I was an exhausting child and I demanded that she come up with an original story about some time in her life over 30 years ago and then recount it in vivid detail when I’m sure all she really wanted to do was go to sleep herself. And she’d do it, telling me stories about walking up and down the street with a wagon full of cans pretending to sell paint, her sassooon boy hair cut, and how she got that scar on her knee while playing in a well…until I fell asleep. She has an impressive memory (except when it comes to what movies she’s already seen – in which case, she’ll accidentally rent the same movie twice on accident). If my future kids ever ask for stories about when I was a little girl, I’m just going to pull up my blog and read posts as though they’re picture books. Straight through to the recipe. They’ll know how to sight-read “teaspoon” first. Growing up, we didn’t eat a whole lot of winter squash in our house. Things were mostly restricted to pumpkin purée and the occasional butternut or spaghetti squash. Which is a shame, because it’s simple to roast into a buttery soft side dish that’s both sweet and nutty. Plus, the acorn squash looks so frilly and dainty with its scalloped edges that I’m pretty sure it’s the most charming vegetable side dish at the party. With my brother eating vegan for health reasons for many years, my family has always been heavy-handed on the soy for Thanksgiving. We made our spinach artichoke dip with soy cream cheese, the bean dip with soy sour cream, and a plump tofurky sat next to our giant golden bird. 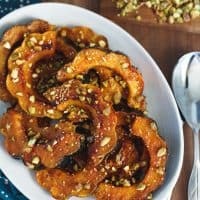 This year, I’m adding soy to the menu in a slightly non-traditional way by mixing miso with fresh ginger and brushing it over crisped oven-roasted acorn squash. This silky smooth squash has a robust savory flavor infused from roasting until it begins to brown. 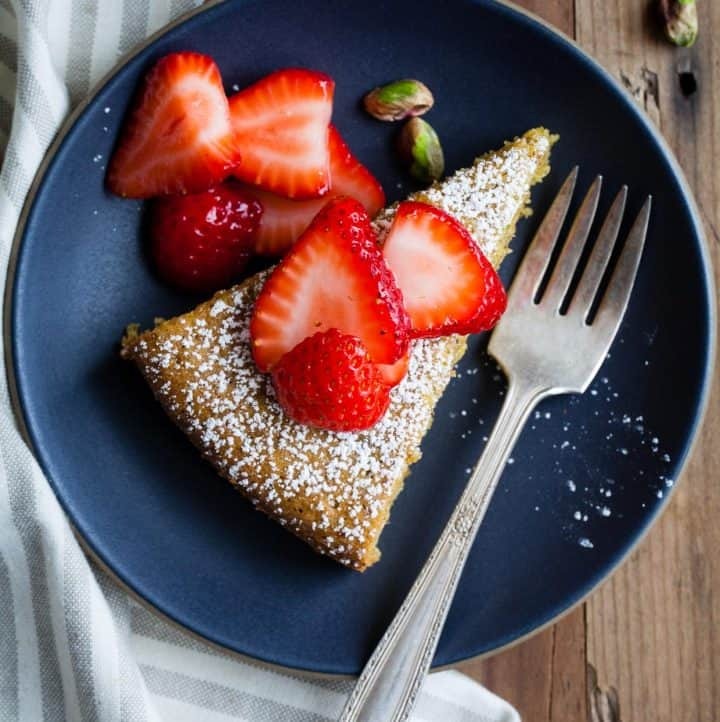 Ginger miso glaze brings out the sweetness while adding a bit of spice, and the toasted pistachios complement the salty and sweet elements to round out the dish. This is a Thanksgiving side that stands on its own – it definitely won’t get forgotten among all the traditional staples. Are you sticking with the classics or mixing things up for your Thanksgiving feast this year? 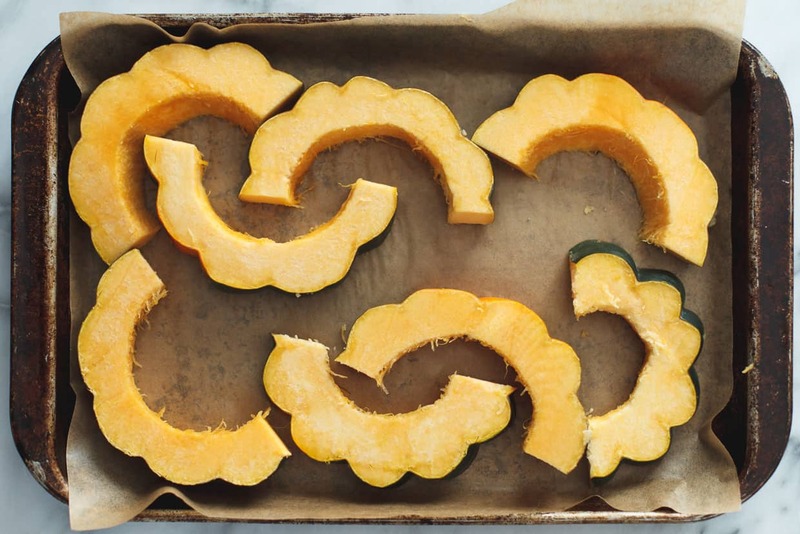 Arrange the cut acorn squash on two baking sheets lined with parchment paper or a silpat mat. Brush both sides of the cut squash with olive oil. Roast for 20-25 minutes, flipping the squash every 10 minutes, until nearly soft when pierced with a fork. Meanwhile, whisk together the mirin, brown sugar, grated ginger, sesame oil, tamari sauce, and rice vinegar in a small saucepan. Bring to boil over medium-low heat. Whisk the water and miso together in a small bowl and add it to the saucepan. Cook for 1 minute longer, whisking until smooth. Remove from heat and set aside. When the squash is nearly cooked through, brush the sauce over the top of each cut squash. 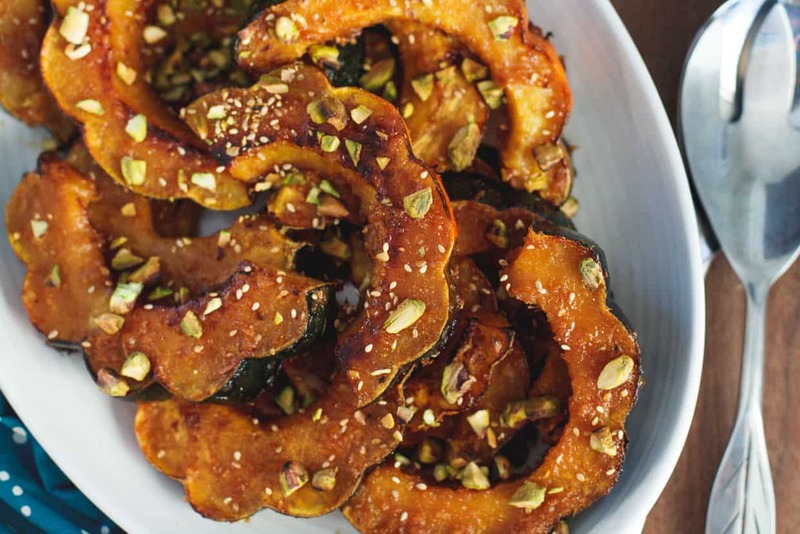 Place the squash under the broiler for 3-4 minutes, until it just begins to brown. Transfer to a serving platter and sprinkle the toasted pistachios and sesame seeds over the top. Eating the skin is optional - some find it adds the right crunch to contrast the smooth center while others think it's too tough. Either way, I like to keep it on while roasting to help hold its shape, and it's really easy to only eat the soft orange flesh by just scraping it from the skin with a fork. Sarah, oh my gawd, this is so beautiful!!! love the ginger miso!! Wow, what a stunning dish for the Thanksgiving table. . love this!!! And I have to lie down with my youngest so she can fall asleep . . and then I go back to my bed. . so tiring but I don’t mind doing it. :) Your mom sounds awesome! I mean, at least she loves to snuggle, right? Eventually my mom started putting a sleeping bag next to their bed so I could crawl in there in the middle of the night when I got “scared”…or really whenever I woke up and it was still dark out. Which was also every single night. Haha. (She is pretty awesome:) Thank you so much, Alice! Beautiful dish! I will be trying this side dish very soon! If your future kids are anything like your handsome Hubby they will be wanting a bedtime story and being tucked in like a little taco! Ask Lucas what this means! Dad read the bedtime story while Mom put her feet up with a cup of tea! Haha – cute. I hope you do make this and love it! I bet Roy would enjoy it! Awwww, I LOVE mom stories! I did the same thing when I was little. I was intoxicated with hearing about my mom’s childhood. And somehow, she was always able to come up with a different story. My mom is coming to visit me next week. All these twinsie things! Right? I have no idea how she came up with so many stories! I just asked her again last night to remind me about a story she told me about when she was a little girl and she spouted off THREE new ones! I hope you have just as much fun with your mom! Yay for visitors! I’m not sure what is on the menu for Thanksgiving this year. I’m leaving that up to my husband’s parents, because we’re going down to San Diego to visit them for the holiday. These sure look tasty! all about this dish my friend! 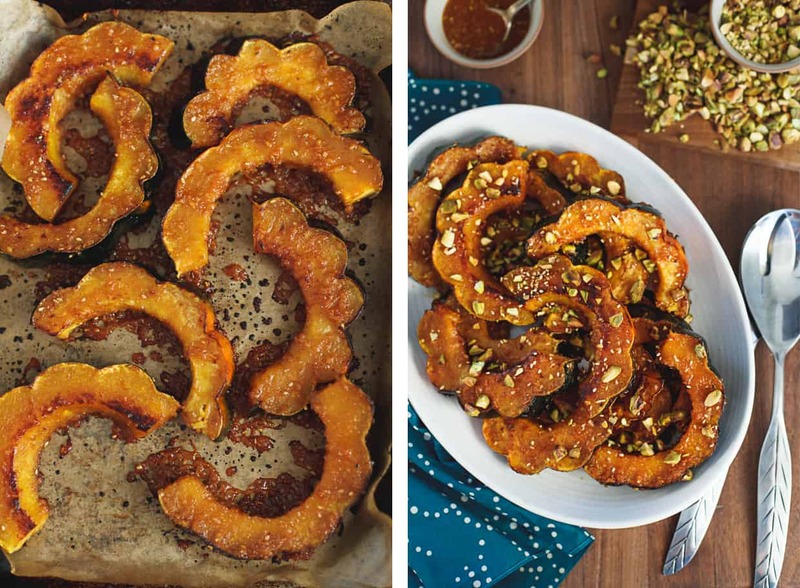 i have a recipe in the book miso glazed delicata and it is one of my favorites. and happy day that your mom is there! Woah! I haven’t even SEEN the inside of your book yet (promise I didn’t mean to copy you:) Operative word is “yet” though, because really, there needs to be more of your squash recipes in my life. Do you remember the nana & papa stories I used to tell you? I can’t wait to try this recipe! You’re right, these do look charming & the recipe sounds delicious!! See! you’re such a great story teller, even adding sound effects. :) Thanks, mom! I loved hearing stories about my parents when I was little. Better than any storybook in my room. You write so beautifully, I’m sure you’re going to have the greatest stories to tell your little ones someday. 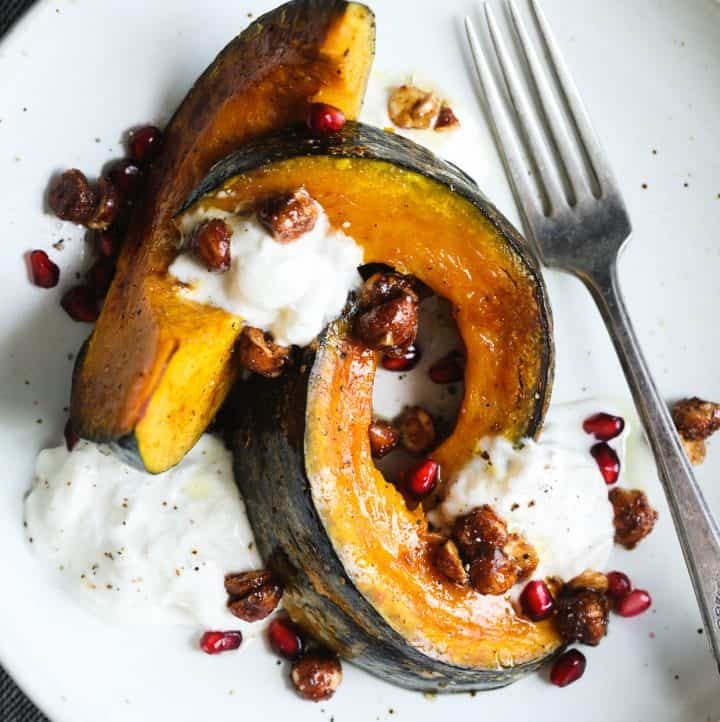 I am loving this acorn squash recipe! The ginger miso glaze sounds just delicious. It really is the frilliest vegetable with it’s pretty shape, so true! Oh my gosh, this sounds SO. GOOD. I’m so with you on the scalloped edges — between that and how cute and mini they are, acorn squashes are my loves. And I love your story about your mom (I feel you on getting stumped on what to write..oy) and I second other comments… your writing is beautiful. Thanks so much for sharing, Sarah!! I feel like I could write a love story to the acorn squash – I love it inside and out:) Thank you so much, Cynthia! I’m glad to know I’m not the only one who occasionally is as a loss for words (I actually keep a document of “writing inspiration” that I add little anecdotes to when they come up…for days when I can’t think of something to write!). Lol I can’t wait to see you bust out your phone at bedtime to read from your blog. That’s a fabulous idea and I should totally do it. Love this squash! Perfect for T-day! “They’ll know how to sight-read “teaspoon” first”…. hahahaha that was SO funny! And this recipe…. so glad you are a fan of acorn squash. I love it too! Never thought of using pistachios… such a great idea Sarah! Thanks, Chris! I bet your kids will sight-read “teaspoon” first too. Or bacon. Mmmmmmmmmmm bacon. Also- this recipe is a showstopper! Look how GORGEOUS it is! Almost too pretty to eat. ALMOST. No she didn’t. I don’t believe you. Thanks, lady! always looking for recipes to make different kinds of squash. nice! Oh MY! 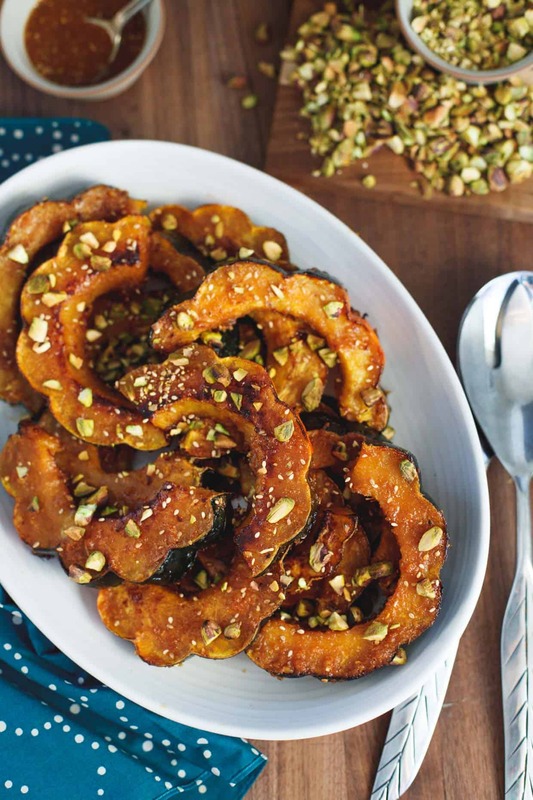 What a gorgeous side dish – and with pistachios too! You are making my mouth water! I just tried acorn squash for the first time, and now I am obsessed! Loving the miso addition here! Pinned! Me too! It’s a new vegetable added to the rotation and I LOVE IT. Thanks for sharing it, Taylor! I love that story! To help me go to sleep I would have my Mom scratch my back. Now my husband gets the luxury of that ;) But I have only had acorn squash I think once but I am loving the flavors here. Definitely adding to our menu soon!! Haha I just made Lucas do that last night when I couldn’t sleep. The problem was that he was almost asleep so it mostly just felt like a weird blob on my back. I hope you try this and love it! What a healthy and flavorful side dish! This would be beautiful on our Thanksgiving table. Enjoy your visit with your mom! Gorgeous! This would be beautiful on a Thanksgiving table! Haha – do it! I think we should make this a thing so all the kids at school are like “oh, my mom was reading a story from her blog the other day…” and that’d totally be a normal thing to say. What a gorgeous side, Sarah! And can I tell you that I’m totally loving that flatware as well? Ah – Thank you! It was a wedding gift from my great aunt – I think Bed Bath and Beyond, maybe? Anyway – they do make the dish feel more fancy, don’t they? Looks like a perfect Thanksgiving side dish for next week! Can’t wait to try these great flavors! Sarah, this looks insanely delicious! I LOVE acorn squash. It may just be my fave squash! The pistachios are genius! You have such a sweet mama to tell you stories every night! I have a terrible memory and am not that creative, so when my boys want me to freestyle a story, I fail pretty miserably. Reading from my blog is not a bad idea! This side dish is like none I’ve seen before, but I would love to try it! The squash looks beautiful, and the flavor combination sounds amazing. Ha – I think that’ll be me too: “Um….did I tell you about the one time that I..umm….made chocolate chip cookies? That’s it. That’s all that happened.” I hope you do get to try it – Thank you so much, Andi! Aaaw, your mom is the sweetest! I used to do the same thing to my mom too and now my son does that to me. I am not as creative as either of our moms and my stories all end up being almost the same haha. 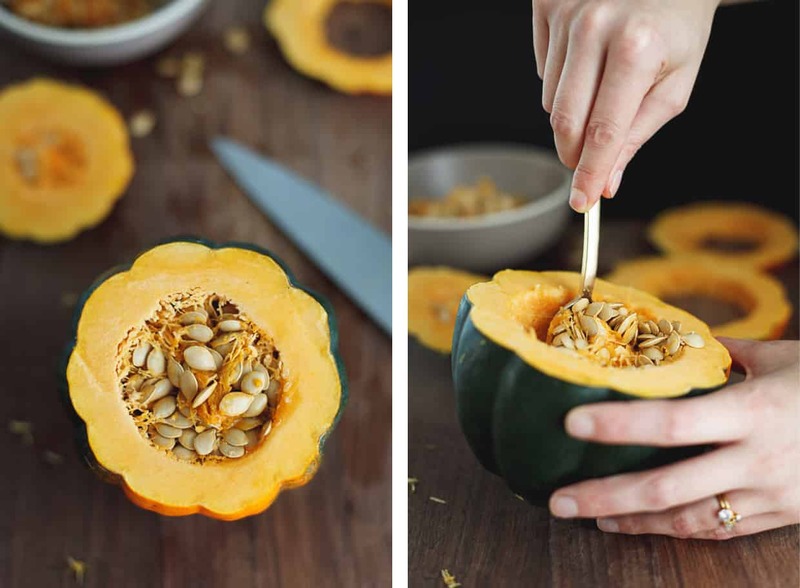 This acorn squash is just gorgeous! 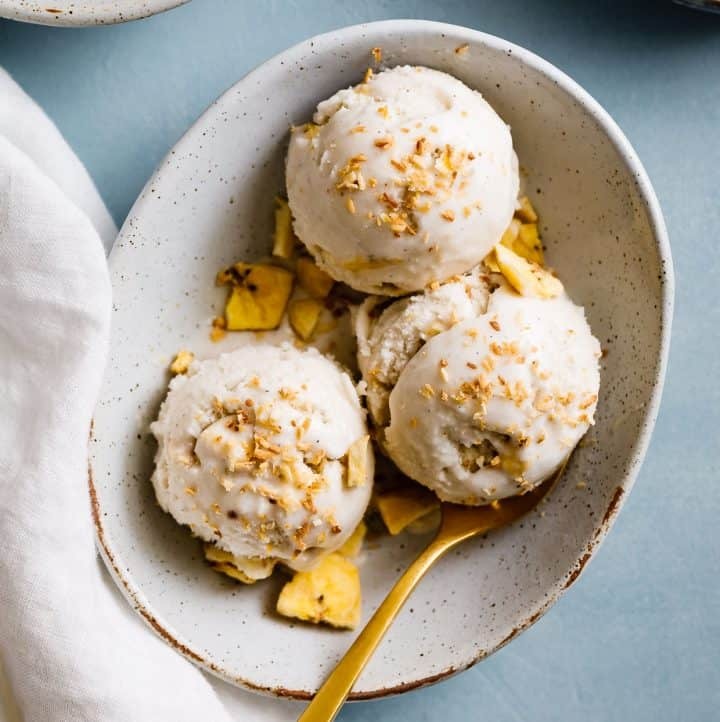 I love the miso ginger and can’t wait to try this. It sounds incredible! Pinning! Haha – their little minds probably think it’s all so magical just the same. Thanks for sharing it, Kelly! What a gorgeous dish Sarah! I bet it’s just bursting with yumminess. “Charming” << YES! And I'm so glad you're having fun with your mom :) Pinned! Hehe – I choose only food that’s charming;) Thanks for sharing it, Trish! It looks so cute and yummy ! The flavors profile in this dish sounds simply wonderful. The squash looks delish. Moms are the bomb! That’s awesome you get to spend some quality time with your mom, and she sounds like one awesome lady! Skinned kneed and boy hair cut? I bet I’d have a ball chit chatting with her! This acorn squash looks amaaaaaazing!! Perfect for this time of year, and it’d make an excellent Thanksgiving side for sure! Aw – my mom is so great to chit chat with! Especially over a glass or two of wine;) Thanks, Julia! I love storytime! I think every roommate I’ve ever had, had to deal with talking to me until I fell asleep. This dish is GORGEOUS! It looks pretty, sounds pretty, and I want it in my belly. Happy Thanksgiving! Blush – you’re too sweet! I agree though – my mom is a pretty neat lady:) I hope you had a super delicious Thanksgiving with your family! Bahaha – can you please tell stories about the Frog Monster on your blog?! I am sensing a guest appearance from your dad coming… Thanks for sharing it, Amy! This looks absolutely lovely! I’m glad you had some mom time while Lucas was away! Just made this recipe for dinner tonight; I think I ate an entire Acorn Squash to myself!! 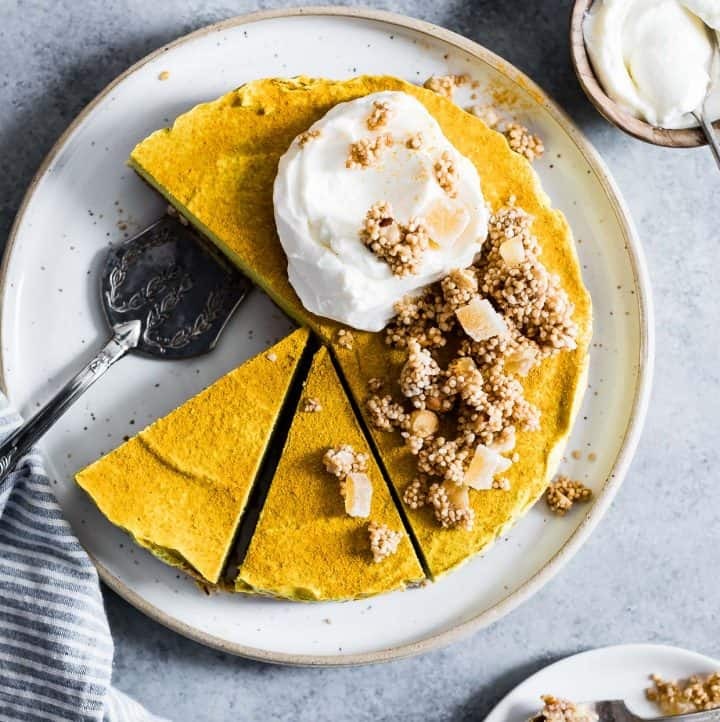 I was so happy to see an Acorn Squash recipe that wasn’t just butter and brown sugar! Thank you! I may have to have this at least once a week! My mom, who isn’t a very adventurous eater, also had rave reviews for this dish!! How perfect! I’m obsessed with this recipe!